Want someone to till your garden 365 days a year – for free? Think it would be impossible to find such a worker? 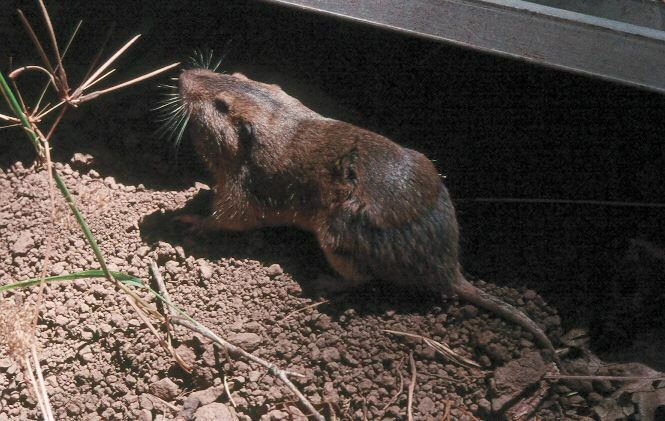 Meet an important native American mammal known as the pocket gopher (Thomomys bottae). Gophers make major contributions to the ecosystems they inhabit by turning compressed earth into finely crumbled loam. They bring subsoil up to ground level, reduce compaction, increase soil aeration, and fertilize the soil by adding organic matter in the form of plant matter and droppings. Few Americans are aware that prior to the 19th century when the soil of the Great Plains was pounded and compressed by millions of bison hooves, gophers worked constantly to reverse the compaction. Abandoned gopher tunnels shelter numerous other wild creatures including burrowing owls and skunks. Gophers have existed since the Miocene Epoch (25-10 million years ago), long before our earliest ancestors. They are called pocket gophers because of their external reversible fur-lined cheek pouches, which are used in underground tunneling and food gathering. Roughly the size of prairie dogs, pocket gophers have stocky, furred bodies, short legs and tails, strong claws, and chisel- like teeth for gnawing roots and dirt. A typical gopher mound of tunneled dirt is fan-shaped with a plugged hole in the “handle” of the fan. Gophers have a good sense of touch and smell and eat about 75% of their body weight daily in the form of roots of grasses and plants, vegetables, and the most delicious of all – dandelions and other weeds. Within their three-year life span gophers mate and bear litters of 3-4 young from January through April. When they are unloading tunneled dirt on the surface and when young gophers are dispersing to new areas they are vulnerable to humans, dogs, and cats as well as natural predators that include raccoons, coyotes, snakes, hawks, and owls. Unfortunately, many people view these helpful native mammals as enemies and use a cruel arsenal of lethal weaponry to crush, impale, gas, strangle, burn, and poison them. Lethal mechanical traps and poisons that are used to kill gophers can also harm children, pets, and other wildlife. For example, slow-moving poisoned gophers are easy catches for owls, which then ingest the poison second hand. Studies show that killing gophers by any means may have little lasting effect as they can repopulate to an even greater density within six months. Allowing a portion of your garden to go natural is a way to limit gopher activity to the natural area. There is beauty in a truly natural landscape, and you will make the wild critters happy. If you have gopher-friendly open space or casually maintained properties nearby, you may have to develop a level of tolerance for gophers in natural areas on your property that are not gopher-proof. Habitat modification and other non-lethal approaches are vital in urging gophers to move on. Most troubling wildlife situations can be prevented or eliminated by removing attractants, installing physical barriers, and using repellents. Lasting natural gopher control requires patience and persistence. Once the gophers have left, take steps to prevent them from returning. If you see signs that they might be back, respond immediately. It is important to ward them off before they settle in and do extensive tunneling. Patient gardeners who are committed to using ecological, humane techniques have had success using the following methods. Try several of these suggestions at the same time for greater likelihood of success. Gophers are very sensitive to smells. Find the gopherʼs lateral tunnel by first probing with a stick to find the 1-1/2” plug in the “handle” of the fan-shaped gopher mound. Expose the entrance to the lateral tunnel that leads down to the gopherʼs main tunnel a foot below ground level. Insert foul-smelling repellents such as used cat litter or a rag soaked with human urine into a tin can with both ends removed. Place the can in the lateral passageway. One visitor to this site mixes clumps of used cat litter from his cat’s litter box with water in a 5 gallon bucket and lets the mixture soak for a few hours or more. Then he pours the foul liquid down the main gopher hole (found in the “handle” of the fan- shaped gopher mound) and over any new gopher mounds that appear. "When the soil is saturated with the smell of cat urine the gophers leave within a day or two,” he reports. A vacating gopher often relocates close by, so gardeners may need to follow it with smelly deterrents until it moves out of the protected garden area. Many gardeners report great success with castor oil intended for garden use. Wet the ground in areas you wish to protect with a castor oil/water mixture by attaching a container of castor oil to a hose-powered sprayer. Gardeners Supply Co. and garden stores offer several castor oil-based gopher and mole repellents that do not harm plants. Wire baskets and wire root guards protect plant roots. These special “gopher-proof baskets and root guards” are made of strong galvanized hexagonal steel mesh that gophers cannot chew through. They protect the critically important root crown from which the other roots grow. They can be used for individual plants and sod installations and are available at nurseries, garden stores, and online. Fencing off a specific area for ornamentals or vegetables is a reliable way to keep gophers out of that specific area. Install 1/2” inch metal hardware cloth to a depth of 2-3 feet below grade and 6-8 inches above grade around the perimeter of the area to be protected. Once the fencing is installed and maintained, it may reduce the need to take temporary measures. Any gophers that are fenced in can be trapped alive in a humane trap such as Havahart Trap #0745 or #1025 baited with a bit of whole wheat bread with peanut butter and molasses on top. Release the gopher on your property unharmed, without touching it, away from the part of your garden that you want to protect. Plant daffodils around and within your garden. Daffodils repel gophers. Some gardeners permit an area of their garden to grow weeds, a favorite food of gophers. Weeds are easy to provide if you have allowed a portion of your garden, ideally the portion most distant from your garden’s most protected area, to go natural. Gophers may be attracted to the weeds and leave the rest of your garden alone. Gophers like a long row of plants that is easy to follow. Don’t plant in gopher-friendly rows. Some gardeners have success with devices set into the ground that emit complex sounds and vibrations. One popular sonic device is the solar Mo Go Repeller available from garden suppliers. Gophers and other wild critters live in a world of their own in which shelter, food, and safety matter most to them. What may appear to us as their insistence on being on our property is simply our mis-reading their normal drive to find shelter, food, and safety in order to survive. Learning to live harmoniously with pocket gophers means learning non-lethal ways to discourage them from doing damage in certain garden areas. It means appreciating their free soil conditioning services in the less manicured parts of our gardens. Our native pocket gophers play an important ecological role. Sources: California Center for Wildlife, Living With Wildlife; Bountiful Gardens and Ecology Action/Common Ground, Gopher Control; Godbe, Alex, Program Director of Hungry Owl Project at Wildcare; Quarles, William, “Stopping Gophers in Your Garden,” Common Sense Pest Control XVII (4) Fall 2001.